I'm sure we each have a sibling, parent, grandparent or relative who frequently - sometimes despite sincere pleas to stop - bombards us with email forwards. 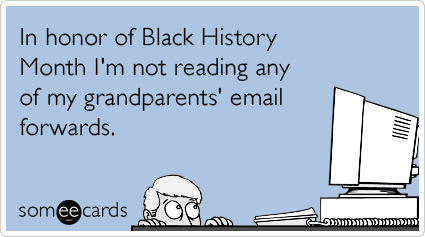 You know the emails I'm talking about - the "Back in My Day," "WTF, Social Security" and "Wake Up America" emails (Buzzfeed has documented 42 different types of these emails). I have two of these fam spammers. A grandmother in Eastern Washington and my wife's grandfather in St. George. The following email forward is the latest to clog my inbox. I'll not post my feelings about what was sent to spare this grandparent's feelings, so what do you think about this email and/or about email forwarders in general? Is a Prophecy Being Fulfilled? On June 13th, the National News reported two items of cataclysmic importance. 1. As of 2014, there will be more children of Minorities, age 5, than children of Whites, age 5, and this trend will continue. 2. In 2012 more elderly whites died than white children were born and this trend will continue. Think of the ramifications of these two bits of news, and flash forward 3 or 4, maybe fewer, National Election cycles, and visualize who will be governing the United States. Of course, many of the "Minorities" beliefs and lifestyles are such that they could be counted with the whites with respect to values, but sadly, many of the Whites' beliefs are contrary to our traditional values. These two news items were attributed to the fact that minority couples have more children than whites. No surprise. The birth rate of white couples is about 1.87 children, fewer than is needed to replace their parents, and has been so for many years. This same trend has also been in effect in most of the "white" nations in Europe for several years. And if the minorities in other countries are not gaining statistical dominance, they soon will. The Proclamation on Families issued by the Church stresses the fact that families are the basic unit of the church and of our civilization, and with the trend toward unmarried women having children, the broken marriages producing single mother families, the ascending numbers of gay and lesbian unions, the eventual result is inevitable. The traditional American Family is doomed. Now given all this, go to the Book of Mormon, 2 Nephi, Chapter 1, verses 6-11. Read them and ponder. I believe that Lehi prophesied just what is happening now, and his warning is clear. Notice that in verse 10, line 1, he says "when the time comes" not "if the time comes." I believe it is unarguable that America as a country has fallen away from Christian values as clearly described by Lehi in verse 10. I believe that God has sent other Nations to take our country because "we" did not remain faithful. I send this as only a warning that dire changes are coming, and we all need to prepare ourselves as and our loved ones as appropriate. But, I don't even know what "appropriate" entails.